So this is it. The last time I'll be cooking with anything fresh from the garden, for a long, long while. Sniff. It's a little sad to think I have to start buying my vegetables from the market again. I've been so spoiled for the past four months. Growing your own food rocks (and saves you money!!!) I didn't have many beets left in the garden, just enough to impart some magnificent colour to the risotto I'd been planning. If food were fireworks, this risotto would be high in the sky. 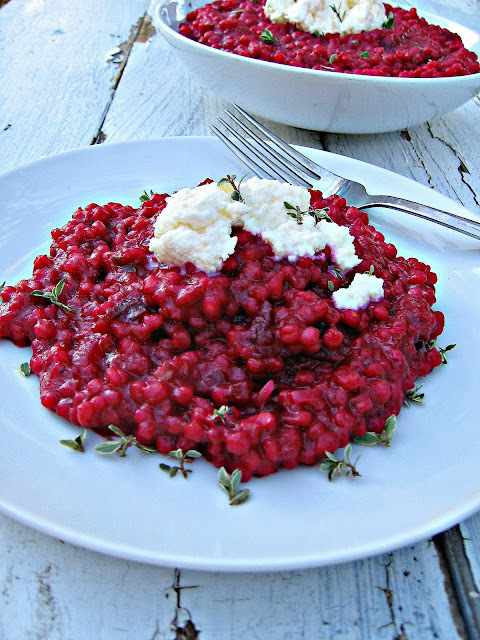 Risotto, as you know, is usually made with arborio rice. Nice, short grain, fat rice. Remember that rice pudding I made, with the caramelized brown sugar crust? That was made with arborio rice. It's really the only rice I have in the house. Well that, and it's healthier cousin, brown short grain rice. I don't eat a lot of rice, really. Can't remember when I had a pot of it on my stove, even. My starch of choice comes from potato-land. Then noodles. Then fun, healthy stuff like quinoa and lentils. I never crave a pot of steamed rice like I do garlic mashed. My rice needs to be gussied up either in coconut milk (yum!) or in a creamy risotto, with butter and cheese. How do you say Calorification? When I spied with my little green eye, this beet-barley risotto, I thought I must make. Don't get me wrong, I loves me some risotto the traditional way, but because it substituted barley, it just sounded so healthy. And healthy is good, right? It's hardly a secret I have one massive sweet tooth. Take a look through the recipe index and see for yourself where my interests lie. To compensate for all of that sweetness (and butter!) when preparing meals at home, I try to cut back a wee bit on the fat and increase my fibre where I can. This risotto fits the bill perfectly. Using the "pearl" barley creates a soft, chewy texture, and while it does have some of the bran removed, it's still loaded with nutrients and fibre. Yay! 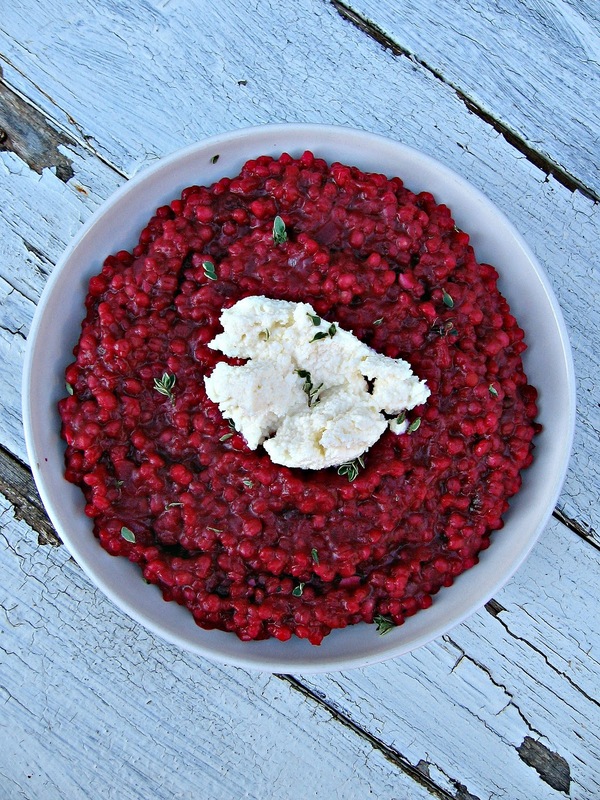 Risotto is not something you want to walk away from. It requires your undivided attention, so don't go shopping for shoes online while trying to prepare this. It's not complicated, at all. Just picky. First you melt a little butter in a saucepan, add some chopped garlic and onion, cook that a bit. Add barley and glugs of white wine. The most work you have to do is just stir in hot broth to the barley and stir, stir, stir until it's all incorporated. And repeat. And repeat. That's all. Takes about 45 minutes from start to finish. Keep the heat on medium low and you'll be fine. While you're at it, keep a glass of white nearby for you, too. I mean you have to have something to keep you company while you're busy stirring. 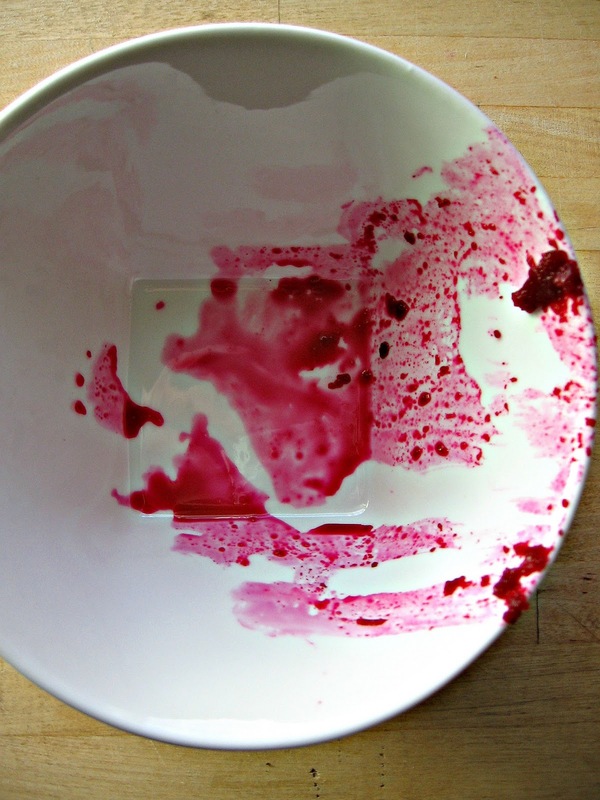 The original recipe called for canned beets, but I used about 1 cup of cooked, puréed beets. Let me tell you, stirring them into the risotto at the end was glorious! Look at that colour - and I didn't really muck around with any of it while editing the photos. That's all beet's doing. Can we talk about ricotta? It really makes this risotto. Yes, it's fine on it's own. Has a lovely, chewy texture and is all aromatic with the fresh thyme and very, very fancy because it's, well, red. But when you get a bite of the ricotta, with the beet-barley combo, it's just really, really good. Ricotta kind of puts it over the top. You need the ricotta. Partner this risotto with any roasted meat - like bone-in chicken breasts, or some nice ribs, or lamb. Mmmmm. Lamb. Now I'm really talking fancy talk. Heat the broth in a large saucepan. Cover and bring to a boil. Reduce heat to low and keep warm. Melt the butter in a large, wide saucepan over medium heat. Add onion and garlic and cook until fragrant, about 1 min. Add barley and stir until glossy, about 1 min. Add wine and stir until barley has absorbed it, about 3 min. Add 1/2 cup of broth. Stir often until barley has absorbed most of the liquid. Continue adding broth 1/2 cup at a time, and stirring, until barley is tender to the bite, keeping heat over medium low, so mixture is just simmering. When all of broth is gone, your risotto should be done. 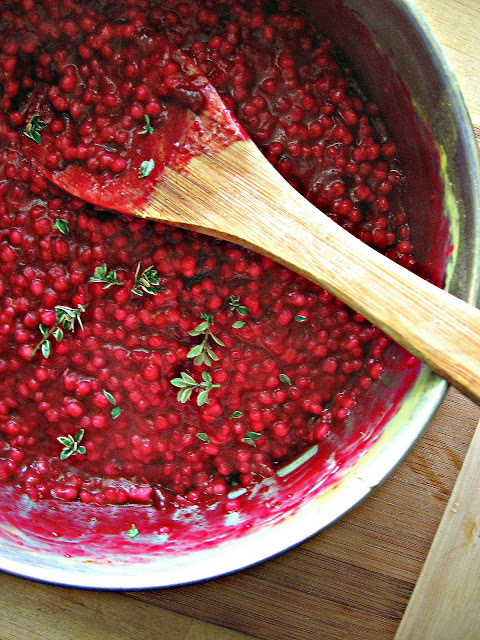 Stir in puréed beets and thyme and warm through. The entire stirring and cooking process will be about 40-45 minutes. Risotto should be slightly saucy but not soupy. Remove from heat. Serve right away, with a generous dollop of ricotta over each serving. Makes enough for 4. Adapted from Chatelaine, Oct. 2011. This is fantastic! 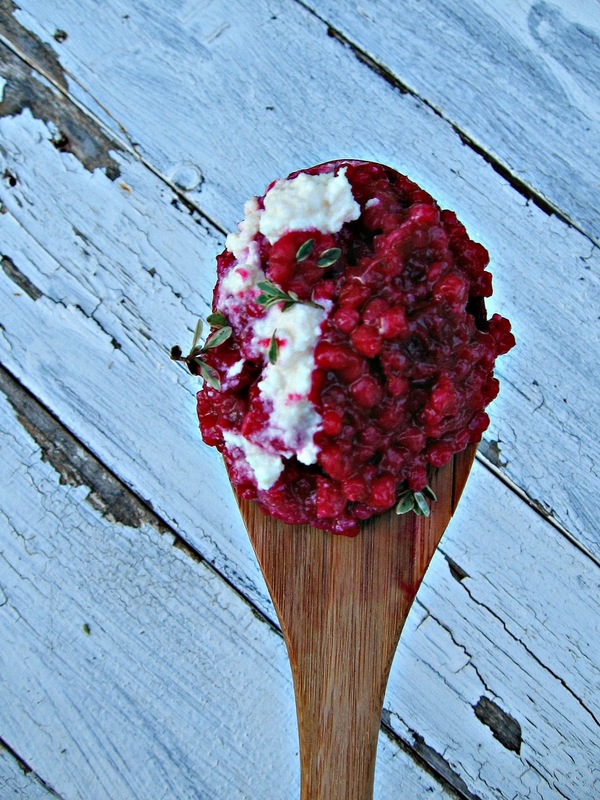 I'm loving it all- the beets, ricotta, barley, and tiny thyme leaves. Super creative and inspiring. Such a lovely color - I love it all too! 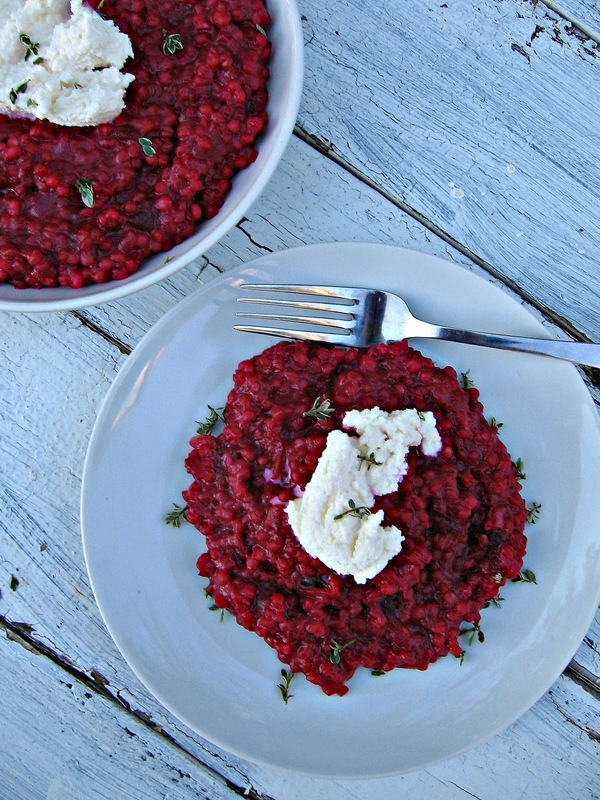 Wow Renee, this risotto looks so pretty and awesome with beets. I love the idea of using barley a well. Thanks Jess and Kate - I do love that deep beet red. Juliana, I quite liked the risotto made with barley, it's giving arborio some competition! Michelle - great idea! I've never heard of preparing barley like a risotto. Interesting... I love the gorgeous red color! 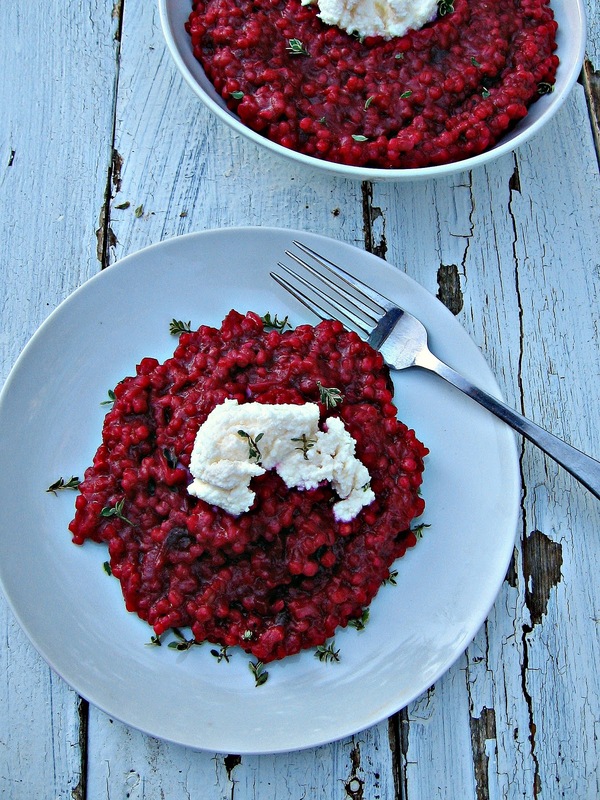 Too bad beets are going out of season- this looks like a perfect dish for the upcoming holidays.